It all started in 2012-13 when the government thought to start reconstructing the Bakhshi-era Bridge over Jhelum River in summer capital. 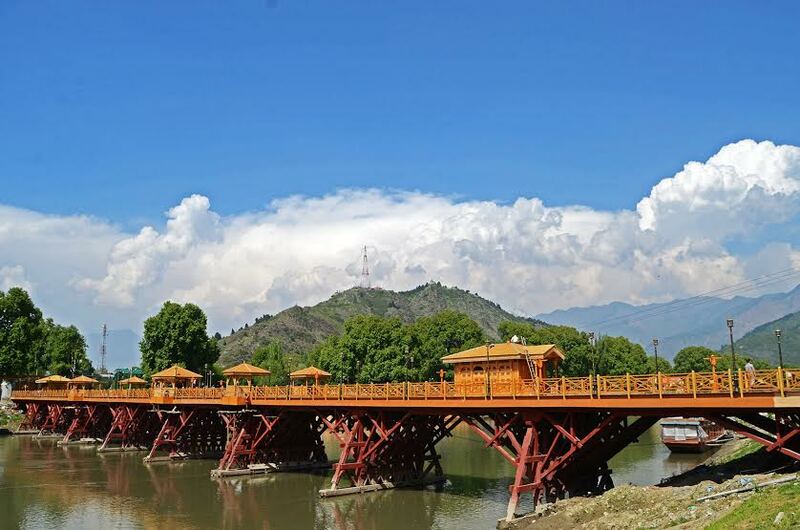 Reconstructed with Deodar timber, Zero bridge is now almost closer to what Kashmir once had in famous Zaina Kadal. 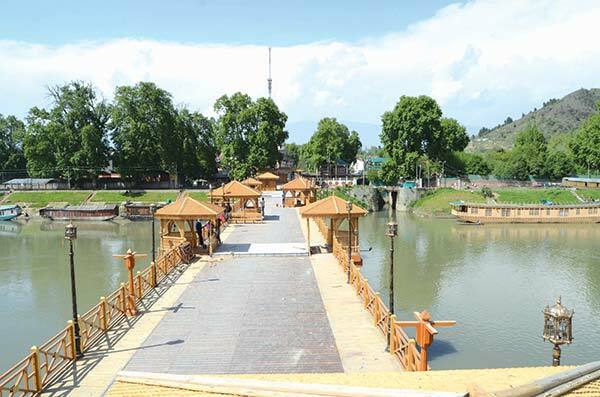 With nine spans measuring 15.5 metre each, Zero bridge connects Dal Gate to posh Raj Bagh via Radio Kashmir and Nawa-ie-Subh complex. Built in 1950s, the bridge was closed in early 1990s. Initially the idea was to secure the three vital installations – Nawa-ie-Subh complex, Radio Kashmir Srinagar and Doordarshan. To ensure its safety, authorities had already closed down Srinagar Club, one of the spots where a bomb blast took place in July 1988. Disuse led to problems and damage to the bridge. It was repaired thrice but every time it remained “unsafe”. The bridge was later permitted for pedestrian movement and people had to cross concertina wires barriers from both ends of it. Later, it was completely closed. The government first asked the executing agency Jammu and Kashmir Projects Construction Corporation Limited (JKPCC) to renovate it for Light Motor Vehicles. 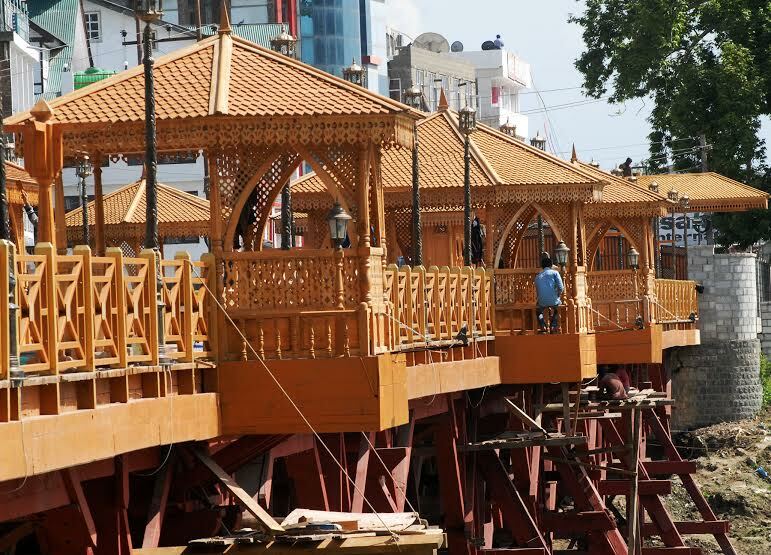 “It is a complete timber structure,” Engineer Ishtiyaq Hussain, site Manager, said. An experienced engineer, Ishtiyaq had a brief stint in US. 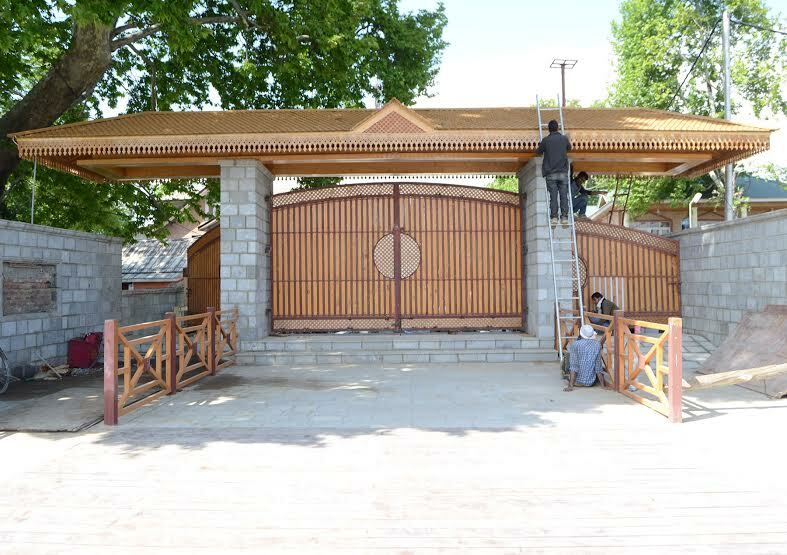 “We extracted almost sixty percent of the timber from the old structure,” Ishtiyaq said. “Only 40 percent was procured fresh.” To ensure they are using the best of timber, he said they checked every old log. The bridge has a timber pile-foundation. “We checked the piles, they are normal and safe,” he informed. “There are around 25-30 piles in each foundation.” According to standard engineering norms, normal life of a bridge is 70 years, he said. Basu and Associates has designed the renovation for JKPCC. After procuring timber from State Forest Corporation, JKPCC got steel for slab from SAIL and “around 4 tons of steel was used in each module” besides scores of cement trucks from state owned JK Cements. A module consists of three spans. While the engineers were working around 16 hours a day to make the Old Zero Bridge motorable for LMVs, in September 2015, when former CM late Mufti Mohammad Sayeed visited the bridge site, the plan changed. Almost akin to entrance of Mughal gardens, as one enters the bridge, the sunlight stops reaching the body as the canopies have been installed over the two gates. Today, when a visitor looks at the bridge from nearby Abdullah Bridge, pictures of vintage Zaina Kadal are brought back. 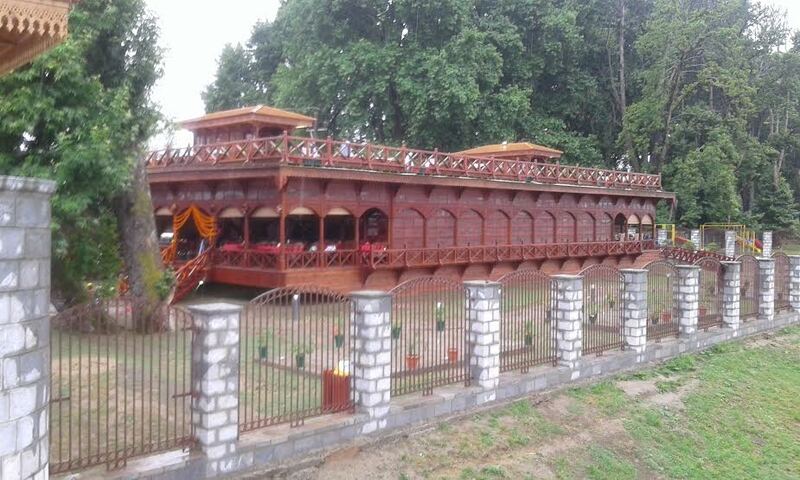 An all wooden structure, the Zaina Kadal Bridge had shops constructed on it. A pedestrian crossing the bridge could do shopping as well. It was a no go area for vehicles. Built by Zain-ul-Abidin, the Budshah, Old Zaina Kadal bridge in 1427, the bridge was destroyed twice by the fires and many times by the ferocious floods. However, till early 1900, both Zaina Kadal and Habba Kadal had rows of shops on the two sides. They were later cleared for better movement of horse-driven carts. A new tourist destination in summer capital. Enter the Zero Bridge: It is not a routine movement; tourism department will be regulating movement on the Zero Bridge now. Next time you walk over Zero Bridge, take rest in one of the Kiosks. Besides, you will have a variety of beverages to taste. 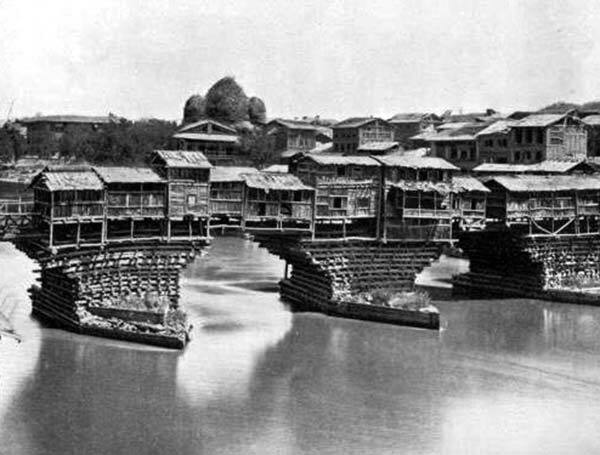 As one enters the Zero Bridge from Raj Bagh end, on the left side of the entrance is built a traditional “Houseboat” on the banks of Jhelum. This structure, blend of traditional and modern outlook, is a restaurant. The Food Court will have four-seater tables in dining room, a kitchen, two wash rooms, besides a lounge. 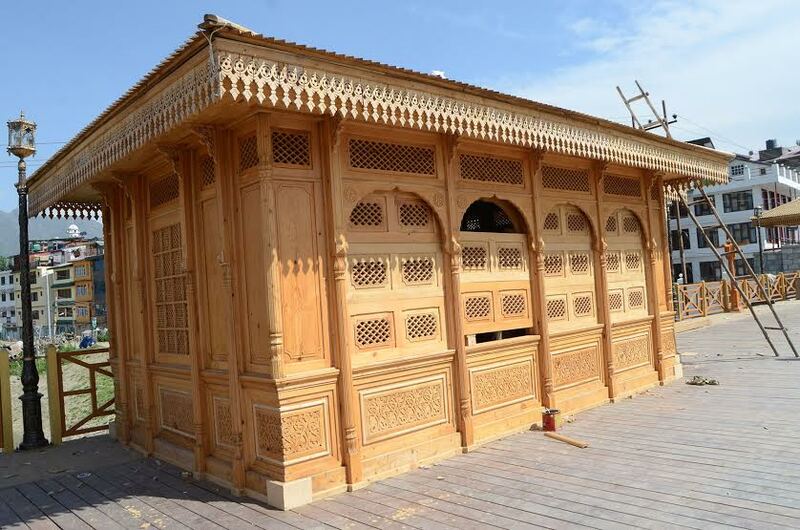 “It is built of deodar,” Ishtiyaq said, “It is completely traditional Kashmiri architecture.” Around 10000 sft of wood has been used to build the Food Court. “The roof has a thermo-treated flooring keeping in view the winter climate in Kashmir,” he said. “It is durable and aesthetically good looking flooring,” he claimed. The engineers have used the left over timber from the bridge site and used that in the roof of the Food Court, he added. 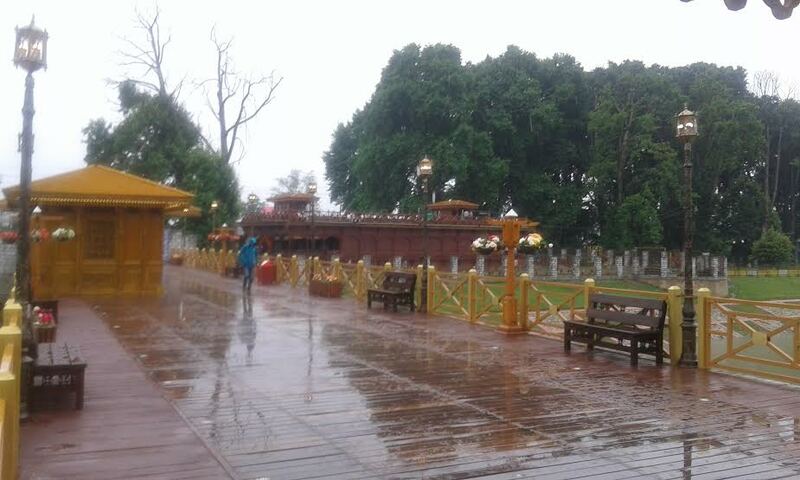 The whole site, the Zero Bridge and the Food Court cost state exchequers Rs 17 crore (approximately). By September 2014, first span was already done. “We were doing load testing of second module,” Ishtiyaq said, “there were minor damages as flood level remained below soffit.” Soffit is super structure of a bridge below the slab.